How to fix washing machine water overflow? The Home Wizard app calculates your ideal home care program to avoid problems with your Washing Machine, but sometimes trouble can still occur. Here are answers to questions about washing machine overfilling washer. My Maytag washer starts to fill with water and never stops. It does not start the wash cycle and will continoue to fill up with water and flood the garage unless I stop it. I can move the dial forward to the spin and it will drain it and spin the clothes dry, but the wash cycle never starts. A bad water-inlet valve may mean that it's no longer able to shut off completely when your washer cycle tells it to close. If this occurs, the valve may leak and allow water to keep coming into the tub. If this is the case, then the valve needs to be replaced. Your washing machine has a water-level switch in it that senses the water level in the clothes tub. A bad or obstructed water-level switch can prevent it from signaling when to turn the water off, so the machine overflows. 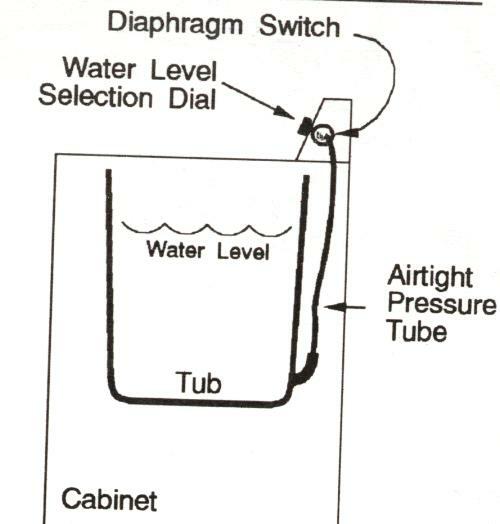 If you can't find any obstruction in the tube that runs from the tub to the switch, then it could be that you need to replace the water-level switch. Thank you for your answer to my original question on 12/13/08. I noticed that you suggested to check for obstuctions in the tube from the tub to the water level switch. It looks like there was a mouse inside the washer because that tube coming from the water level switch is only about 10" long and appears to be chewed on and goes nowhere. This is supposed to attach to the switch on the one side and the tub on the other correct? The key is that to operate properly, it needs to be air-tight and un-obstructed. If you found a 10" section of the tube that looks like it had been chewed through by a mouse, then I would suspect that the rest of the tube will hanging from either from the tub or the water level switch (unless this got dragged off somewhere). Thank you so much. I ordered a new air tube today.
. . . great. If you need help with anything else, just let us know. If you have mice chewing through your washing machine's water level air tube, then they may also be inside you walls chewing on electrical wires (which is a favorite thing they like to do). This can cause electrical shorts, and can be very difficult and expensive to find and repair, in addition to the safety problems that they represent. So you may want to bring in a professional exterminator, and begin to follow our recommended pest control maintenance tasks. Happy New Year to you as well, thanks.